Sequence pans across a wide view of the region surrounding the SMC. ↑ Shapley, Harlow; Sawyer, Helen B. (August 1927), "A Classification of Globular Clusters", Harvard College Observatory Bulletin (849): 11–14, Bibcode:1927BHarO.849...11S. ↑ "Distances, Ages, and Epoch of Formation of Globular Clusters" . The Astrophysical Journal. doi:10.1086/308629. Bibcode: 2000ApJ...533..215C. Retrieved on 2008-11-12. ↑ ၇.၀ ၇.၁ Forbes, Duncan A.; Bridges, Terry (May 2010), "Accreted versus in situ Milky Way globular clusters", Monthly Notices of the Royal Astronomical Society 404 (3): 1203–1214, Bibcode:2010MNRAS.404.1203F, arXiv:1001.4289, doi:10.1111/j.1365-2966.2010.16373.x. ↑ "High-Resolution X-ray Imaging of a Globular Cluster Core: Compact Binaries in 47Tuc" (2001). Science 292 (5525): 2290–2295. doi:10.1126/science.1061135. PMID 11358997. Bibcode: 2001Sci...292.2290G. 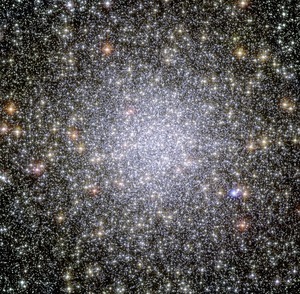 ↑ "Hubble Space Telescope Proper Motions and Stellar Dynamics in the Core of the Globular Cluster 47 Tucanae" (2006). Astrophysical Journal Supplement 166 (1): 249–297. doi:10.1086/505692. Bibcode: 2006ApJS..166..249M.